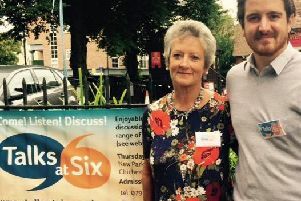 Chichester’s Talks at Six moves into a new era – new, bigger premises after months of success. The series has become an important part of the Chichester scene in the past couple of years offering Thursday early-evening talks on a wide range of subjects at the New Park Centre. Now it is stepping up. At the new venue: Thursday September 27– Brexit – the Challenges for Britain by Richard Ashworth MEP. As our area MEP Richard is in an excellent position to keep us up to date with the negotiations in Brussels and what it will mean to us all. Thursday October 4– Women make Music by Angela Zanders who will explore the names of female composers of classical music, few of whom are known today. (back in the Studio, New Park Centre). Thursday, October 11 – Notes from Arts Studio by Philip Jackson who will talk about his life in sculpture, his commissions around the world and the process of idea to final work. Thursday, October 18 – From Olympic Games to Caring by Christina Bassadone. The two-times Olympic sailor will talk about her Olympic experiences in Athens and Beijing and her award-winning business. Thursday, November 1 – Think Before You Throw by Rachel Carruthers from West Sussex Waste. The talk will help again understand the logic of recycling. Thursday, November 8 – Lest we Forget: Figurative WWI war Memorials by Paul Devonshire. Thursday, November 15 – It’s a Balloon World After All by Rob Driscoll who will demonstrate some of the incredible things that can be done with balloons. Thursday, November 29 – Hidden Chichester by Andrew Berriman. How well do you know Chichester? How many of these fifty somewhat unusual sights can you identify? Andrew will show you the Chichester you have missed.